The phase space structure for the vibrational dynamics of molecular systems with strong chaotic behavior is a very interesting topic in chemical processes  . For practical applications several chaos indicators are used in literature, such as maximun Lyapunov exponent (LE)  , fast Lyapunov indicator   , frequency map analysis  , small alignment index (SALI)   , or the stability geometrical indicator (SGI)  . This approach has been applied successfully in the calculation of Lyapunov exponents in Hamiltonian systems with many degrees of freedom  , after simplifying the JLC equations by coarse graining. We can define via the JLC equations the SGI indicator along trajectories. This indicator has been recently used to study the stability of trajectories in this molecular system  . We will use SGI for short times to locate stable periodic trajectories (with its corresponding chains of islands) and chaotic ones as local minima or maxima respectively of this indicator. The boundary of the Hill’s region1 for systems with Gaussian curvature everywhere positive (locally stable) has been considered as a very important set to generate unstabilities because of its curvature  . As in the classical billiard problem non convex points (negative curvature) of the boundary are considered defocusing points related with unstable behavior of trajectories reaching these points. Thus trajectories probing the non convex points of the boundary are always chaotic and those trajectories reaching uniquely convex points of the boundary are regular as indicated in  . In this paper we show that this statement is not true in general showing that although our system is positively curved everywhere we can locate chaotic trajectories restricted to convex parts of the boundary of the Hill’s region and regular trajectories reaching non convex points. The organization of the paper is as follows. In Sections 2 and 3 the geometric approach is described, relating chaos with JLC equations. In Section 4 the model LiNC/LiCN and its geometrization are presented. In Section 5 we present the results for trajectories with initial conditions at the boundary of the Hill’s region using the SGI. In Section 6 the importance of the boundary in order to study the stability of trajectories is discussed. Finally, the conclusions are summarized in Section 7. Table 1. Equivalence between some relevant magnitudes in the Dynamical and Geometrical views of the Classical Mechanics. being the conjugate momenta in the phase space . where represent the local coordinates and being referred to as mechanical manifold. It can be shown that the trajectory followed by a particle affected by the potential energy function in the Euclidean space is equivalent to the motion of a free particle in the restricted mechanical manifold . Thus there is a correspondence between dynamics in an Euclidean space (zero curvature) and kinematics in a Riemannian manifold. that corresponds to trajectories parametrized by physical time . The sectional curvature , at the point and tangent plane on the Riemannian manifold at this point (Gaussian curvature in dimension two), determines the velocity of spreading for the geodesics starting at tangent to . the Riemann-Christoffel curvature tensor  . with the scalar curvature for metric . The evolution for is as much lineal and the stability is determined by the scalar (from now on referred as ) along the fiducial curve. with initial conditions . We will use this indicator to compare the mutual relative stabilities for different trajectories. and represent the Li-NC and NC reduced masses, respectively. Figure 1. (Left) Potential energy surface for the LiNC/LiCN isomerizing system. Contours lines have been plotted every . The minimum energy path connecting the two isomers is shown as a dashed line. (Right) Energy profile along the minimum energy path. The energy profile associated to the MEP is given in the right panel of Figure 1.
corresponding to the negative branch in the calculation of the second-order equation obtained. We represent PSOS values in the interval rad taking into account the symmetry of the molecular system. This scalar curvature (Gaussian curvature) is everywhere positive, i.e. every trajectory is locally stable. The differential equations system to integrate numerically consists on (1.19) and (1.20) simultaneously. In order to characterize the dynamics of the system the selection of initial conditions to integrate trajectories is very important. All the trajectories we have integrated reach the boundary of the Hill’s region at some time. This fact motivate to study the dynamics in our molecular system through trajectories with initial conditions at this boundary. lightly higher with value obtaining the results plotted in Figure 2. Stable trajectories and chaotic ones for the interval rad for the upper region of the boundary (red colour in upper left graph in Figure 2) are represented in Figure 3 labeled from (1) to (8). The stable periodic trajectories correspond with local minima values of SGI in particular the points (1), (2), (3), (5) and (7), and the chaotic trajectories with (4) and (8). The trajectory represented with (7) is the most stable trajectory of the system related with the KAM torus with the most irrational relation of frequencies, being this torus the last one broken in the transition from order to chaos. The corresponding trajectories in are represented in the upper graphs of Figure 3. Chain of islands are represented as those forming the corresponding valleys in the global SGI diagram, the stability of the resonant periodic orbit in the minimun is indicated by the width of the valley as illustrated in the Poincaré Sections in Figure 4. 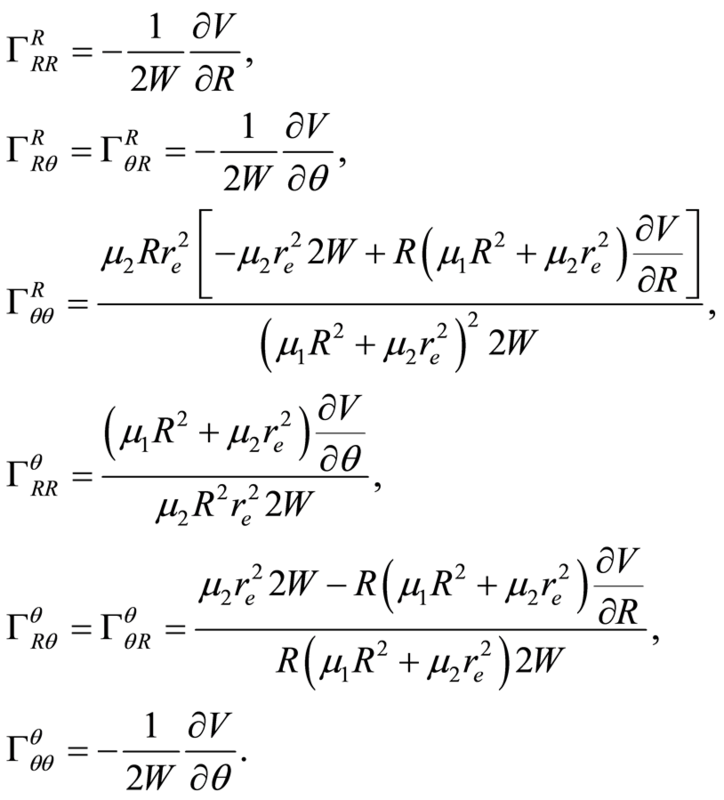 In order to locate a chaotic trajectory from the global SGI diagram we search for hyperbolic points located between the chains of islands (Poincaré Birkchoff Theorem) so we take initial conditions at the extrema of the previous valleys represented by local maxima labeled by (4) and (8) in Figure 3. The Poincaré sections for all these trajectories are illustrated in Figure 4. The indicator SGI is calculated along trajectories with initial conditions at the boundary for energy locating a chaotic trajectory and a periodic one represented by the maximum and minimum points in the graph for SGI in Figure 5. The Poincaré sections are illustrated in Figure 6. Figure 2. Values of SGI for different trajectories with initial conditions all along the boundary of the Hill’s region (upper left graph) for the energy, , the interval rad of the upper region (red) is zoomed where a stable periodic trajectory (i) and another from the chain of islands (ii) are marked. Figure 3. Values of SGI for trajectories with initial conditions in rad for the upper region of the boundary (red colour in upper left graph in Figure 2) at the energy . Stable periodic trajectories are marked as (1), (2), (3), (5), (7) and chaotic trajectories as (4) and (8). The quasiperiodic trajectory (6) is the most stable trajectory of the system. Corresponding trajectories in are plotted in the upper graphs. The boundary of the Hill’s region and particularly the sign of its curvature is often related with the stability of trajectories bouncing on it. In systems with Gaussian curvature everywhere positive inside the Hill’s region is quite natural consider the non convex (negative curvature) regions of the boundary as source of unstabilities for trajectories bouncing on it. In this sense we could say that regular trajectories should probe or touch only convex regions (positive curvature) of the boundary of the Hill’s region as well as chaotic trajectories should probe the non convex region at least once  . Figure 4. Poincaré sections for all trajectories represented in Figure 2 and Figure 3 for the energy . The black curve represents the boundary of the accessible region in the phase space. Figure 5. Values of SGI for trajectories with initial conditions in rad at the energy . A stable periodic trajectory is labeled with (1) and a chaotic one with (2). Corresponding trajectories in are plotted in the upper graphs. region (negative curvature) of the boundary and another chaotic trajectory restricted to convex regions of this boundary. We study the convexity for different set levels and plot the points of curvature zero (change of convexity) as the red curve in Figure 7, the non convex points on the lower region of the boundary for the energy are in the interval rad. Figure 6. Poincaré sections for the two trajectories represented in Figure 5 at the energy . The black curve represents the boundary of the accessible region in the phase space. Figure 7. A chaotic trajectory (a) restricted to convex points of the boundary of the Hill’s region and a stable periodic trajectory (b) reaching the boundary at non convex points at the energy . These trajectories correspond to (4) and (i) respectively in Figure 4. The two trajectories studied with this energy are labeled as (i) (regular) and (4) (chaotic) in Figure 4 where their corresponding Poincaré sections are plotted. These two trajectories in and the zero curvature for the corresponding set level are plotted in Figure 7. The chaotic trajectory only probes the convex region of the boundary while the regular one bounces non convex points. The behavior of the chaotic trajectory comes to support the well known idea of the parametric resonance as fundamental reason for the onset of chaos. But the regular trajectory motivates the idea of an additional stabilization mechanism. When defining the Jacobi metric is quite often to understand the potential energy as curving the underlying space (with the kinetic energy tensor as metric), in the particular case of an underlying space of curvature zero (usually ) the first term in the right hand side of Equation (1.22) is zero and the curvature is caused by the energy potential. In our molecular system the kinetic energy tensor defines an underlying space positively curved with curvature expressed in (1.26). Thus although the potential energy is removed the space is equally positively curved. Taking into account the stability is ruled by (JLC) Equations (1.13) where includes the underlying curvature we can deduce the corresponding stabilization effect in the dynamics. In this work, we have studied the vibrational dynamics of the isomerizing LiNC/LiCN molecular system described by a two-dimensional Hamiltonian model including a realistic potential function from a geometrodynamical perspective. We have considered trajectories starting at the boundary of the Hill’s region and characterized the corresponding dynamics. Once defined the geometrical SGI indicator, we have calculated its value for short times along trajectories with initial conditions in the boundary of the Hill’s region, identifying stable periodic trajectories as local minima of that indicator and the width of the corresponding valley as measure of their stability. We have also identified chaotic trajectories as local maxima around the previous valleys just in the extrema of the corresponding stability region. The importance of the curvature of the Hill’s region for the stability of trajectories has also been studied. We have found that stable trajectories for our system are mainly located at values of rad and rad in the interval , corresponding to the most convex regions of this boundary. In pinciple, this would support the possibility of reducing our system to a classical billiard problem. However, we found a stable periodic trajectory out of this region. This stable periodic trajectory probes non convex points of the Hill’s region. On the other hand we also find a chaotic trajectory inside the supposed “stability region” bouncing uniquely on convex points of the boundary. Accordingly, the study of stability of trajectories in our molecular system cannot be reduced to a classical billiard problem, despite the Gaussian curvature everywhere positive inside the Hill’s region. This result comes to support the hypothesis of the parametric resonance as the main criterion for the onset of chaos in the case of the chaotic trajectories. However, in the case of the regular trajectories by probing non convex regions of the boundary we understand the underlying curvature (Equation (1.26)) to be the responsible for this lack of unstable behavior. This stabilization mechanism, through the scalar curvature of the underlying space, is currently being under active research in our group. This research was supported by the Ministry of Economy and Competitiveness-Spain under Contracts No. MTM2012-39101 and ICMAT Severo Ochoa SEV-2011-0087. 1Projection of the accessible region in the configuration space on the position coordinates. 4 , i.e. is the inverse matrix of .